The princesses are presenting a collection of stunning prom gowns in the most fashionable colors of spring and summer-2018. The mermaid princess will introduce baby-pink gowns, Jasmine will walk the runway in lilac and Goldie’s color is spring green. 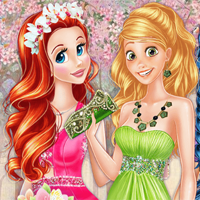 Check out those gorgeous colorful gowns and pick one for yourself!